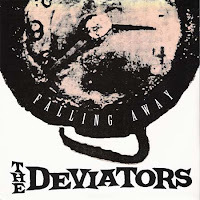 Had they released more than a handful of singles and/or had I the opportunity to see them live, The Deviators would have probably been amongst the most coveted bands in my 1990s small of fame, but alas, what can you do? Brooklyn's "fab four" (ok, bit of a stretch there) unleashed three 7" s on a rather ignorant public in the early '90s, two of which are extolled upon in this write-up. 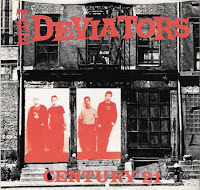 The Deviators recipe was pretty straightforward - mid-tempo punk with pop underpinnings, topped off with an unmistakable garage rock disposition. And class, boy did these guys have class. They could have even taught the sauve-faire Hives a thing or two. The Falling Away triple shot, is the superior of the two disks. The a-side, as punchy and melodic as it is, is outdone by the melodic, propulsive thrust of "Just Another Story," reminiscent of what contemporaries Moral Crux were achieving with equally fine results. Another three-song "ep," Century 21 actually predates "Falling Away" by a couple of years and the difference is quite evident. The title cut is Clash-y as-all-get-out, hearkening back to The Clash and Give Em Enough Rope to say the very least. The Ramones-y b-sides are fun and well executed, just not revelatory. Although seeing the Deviators live in the flesh just wasn't in the cards for yours truly, I did speak to guitarist/vocalist Pablo Medina a few times in the mid-90s, and by jove, you couldn't find a nicer bloke. Should anyone know how I might be able to score a copy of the Deviators "Seeing Double" 7" please get in touch. Enjoy. The Deviators...always a fave. Good post. I tossed this one up a while ago in hopes of finding my way to the band members. The Deviators used to be Nobodys Heroes. They did a 8 song or so demo back in 199O. Another band had the name and they wanted to get away from the whole SLF thing, so they changed their name. They also are on a EP called Benefit For Beer with the Casualties & 2 other drunko bands. Members used to be in Zombie Squad, but I forget who. Great band...did gigs at ABC No Rio all the time. Enjoying the blog as always. One of my faves. Seeing Double was released on Combat Rock records. B-side was Someone Should've Warned You & Century 21. Benefit For Beer 7" comp was released on Swill Records. Their song was: In A Crowd. The other bands on that comp were: Public Nuisance, Jesus Chrust, & The Casualties. There were two pressings. There are also White vinyl copies of the Century 21 7". I only got to see them once, there were amazing! any chance of re-upping this one? Merry Christmas (or a happy belated Chanukah)!